As qualified Winter Mountain Leaders we can take you up into the mountains to gain that special and unique winter experience in the knowledge that you will gain experience within the safety of a guided group. We will also teach relevant winter skills during your journey. Feel confident in the mountains in summer conditions but lack the necessary skills and knowledge for snow covered mountains? 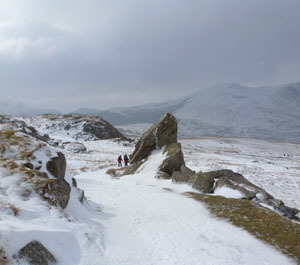 Winter mountain walking opens up a whole new world of pleasure of crisp, cold mountain days playing in the snow.